LAS VEGAS. 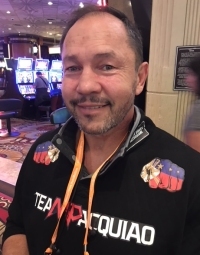 WBA welterweight champion Sen. Manny Pacquiao’s Australian strength and conditioning coach Justin Fortune minced no words in calling Adrien Broner “a dog and a coward who beats up women” so when the challenger from Cincinnati feels the Filipino icon’s power in their scheduled 12-round title bout at the MGM Grand Garden Arena this morning (Manila time), he’ll quit. Broner’s family is coming in full force. His girlfriend Arienne Gazaway will be at ringside with his seven children, Adrien, Jr., Adrieon, Admire, Armani, Kenyatta Smith, Na’rya Ross and Aalayah. The children have three different mothers but father-figure and co-trainer Mike Stafford said the last two are Broner’s with his current girlfriend. Broner’s twin Andre, brothers Obryan and Levi Tolbert and sister Marie will also be in the venue with his mother Dorothy and step-father Thomas Knight. But the ‘hood won’t be as loud as the Filipino community in the audience. Pacquiao’s physician Dr. Regina Bagsic of Cardinal Santos Medical Center is in town to watch the fight.